This is just my version of the popular Greek "street food". 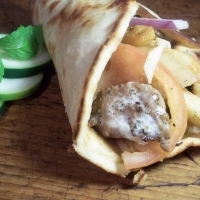 We love this and can eat it on kabobs with onion, peppers and tomatoes then sprinkled with feta, or, as I did, here, in the grilled flatbread with the "fixin's" all wrapped up inside! In large zipper style bag, combine meat with lemon juice, vinegar, butter, olive oil, Worcestershire sauce, garlic, salt, pepper, oregano and mint. Let marinate in the fridge at least 4 hours, up to over night, flipping occasionally. Remove meat pieces from marinade and skewer on metal or soaked bamboo/wooden skewers. Grill or broil about 6 minutes each side, until done. Toss the pita breads on the grill, too, to soften slightly, if desired. Sorry about the picture...it's hard to actually see the pork. SO the marinade stayed completely by the recipe. However I left out the pitas/flat breads and just grilled the meat up WITH the purple onions, tomatoes and the addition of yellow bell pepper. SO GOOD! Of course I took your suggestions and served this with Easy Greek Tzatziki and Greek Fries . They all go SO well together! Sounds really good. Love this stuff!